A trip to the College World Series on the line, University of Miami reliever Mike Browning took the mound focused in this May 1981 game, according to The Associated Press. He had to be. Florida's Dave Falcone, the possible final out of the eighth inning, took Browning deep in their last meeting, The AP wrote. "When I came in I had Falcone on my mind," Browning told The AP after preserving the Miami win. "I didn't even think about the other hitters. I figured I'd get them, but I couldn't wait to get Falcone." Browning turned pro soon after and he likely couldn't wait to move up. His career went on for a decade and a half. He made it as high as AAA, but as long as he waited, he never made the majors. Browning's career began that year in 1981, taken by the Yankees in the 14th round of the draft out of Miami. 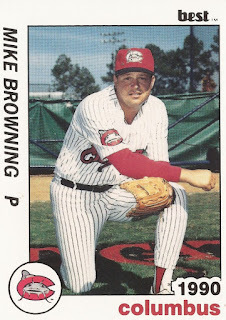 Browning started with the Yankees at single-A Fort Lauderdale. He picked up one win and one save in 17 relief outings. He returned to Fort Lauderdale for 1982, but he played the majority of the year up at AA Nashville. He even got into four games at AAA Columbus. Browning saved 14 games overall. Browning split 1983 between Nashville and Columbus. He then moved to the Angels and AAA Edmonton for 1984. After not being recorded as playing in 1985, Brownig played the next three seasons back in Miami for the unaffiliated Miami Marlins. In 1989, he returned to affiliated ball at AA Columbus with Houston. He went 9-6 over 52 relief outings. Browning played 1990 between three teams and two organizations. He played back at Columbus and briefly at AAA Tucson. He also got five games with the Indians at AAA Colorado Springs. Browning then moved to Mexico for four seasons. He didn't return stateside until spring 1995, signing with the replacement Royals. That February, he spoke to The AP about his return. "Everybody who has been down in Mexico that long and gets to come back is very fortunate," Browning told The AP. "I stuck it out a long time in Mexico. This is my last hurrah." Browning played out that season back in Mexico and at independent Thunder Bay. His final pro season came in 1996 as a player-manager at Thunder Bay, ending his career.